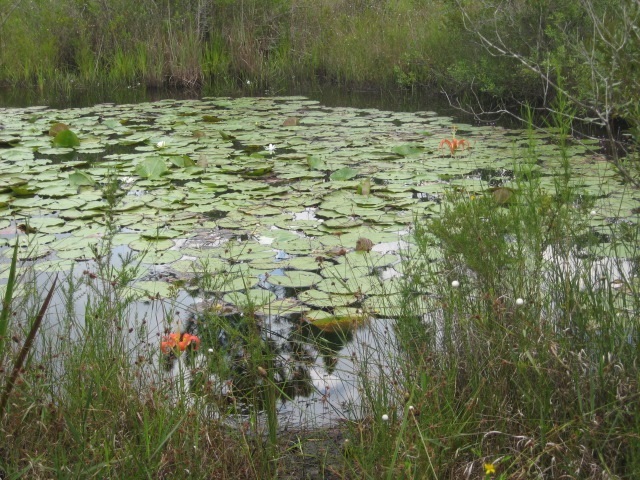 Adjacent to the Hal Scott Regional Park and Preserve, the Pine Lily Preserve is managed by Orange County as part of their Green Place conservation lands program. Cypress domes, pine flatwoods, hardwoods, freshwater marsh and riverine swamp habitats along Long Branch (a tributary of the Econlockhatchee River) harbor a rich assemblage of flora and fauna. Start at the parking area at CR 13, which has a picnic area and trailhead. There are over 2 miles of foot trails, including a connecting trail which runs south to Hal Scott’s red trail loop. Bachman’s Sparrow, Brown-headed Nuthatch, Northern Bobwhite, Common Nighthawk and Common Ground-Dove reside in the flatwoods; Sandhill Cranes forage in the wetlands and Barred Owls call out along the swamp’s edge. The hardwood hammocks support Palm Warbler, American Robin and Ruby-crowned Kinglet in winter and nesting White-eyed Vireos in summer. Short-tailed Hawks have been recorded here. Look for the preserve’s signature species, the fire-dependent and state-threatened Pine Lily – a beacon of fiery red amongt the otherwise green landscape.